Jon Peddie Research (JPR), the industry's research and consulting firm for graphics and multimedia, announced estimated mobile devices graphics chip shipments for 2011. Mobile devices include smartphones, tablets, cameras, vehicles, and game consoles. The market for smart mobile devices is soaring. Mobile devices are not necessarily replacing the PC, but they are outselling PCs. Increasingly mobile devices have a graphics processor and those processors are integrated in the device's system on a chip (SoC) application processor. The leading high volume suppliers of application processors (i.e., SoCs) are Apple, Texas Instruments, Qualcomm, and Samsung. Three of the four use Imagination Technologies' GPU IP. Those companies, plus several others who use Imagination Technologies IP puts Imagination Technologies as the industry leader in supplying GPU IP, vertically integrated or otherwise. Imagination recently announced the first products in its PowerVR Series 6 family, previously codenamed "Rogue." The company also said it has eight licensees for Series 6 cores including: ST-Ericsson, Texas Instruments, Renesas and MediaTek (plus JPR believes Apple, Intel, and Samsung). This is along with MStar, Ricoh and Rockchip, joining existing partners like Sony, Sigma and Realtek for the company's PowerVR Series5 family. 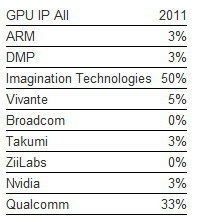 Vivante is the surprising number two in IP GPU suppliers. Products incorporating Vivante technologies are based on the Marvell Armada and PXA communications processor. The PXA920 ships in mass market China Mobile OMS and Android TD smartphones from ASUS, Huawei, Lenovo, Samsung, ZTE and many others. Vivante's other licensees include Texas Instruments, Freescale, HiSilicon, Ingenic, Rockchip, and many more. We are including in our definition of "mobile": Smartphones, high-end feature phones, Tablets, Portable Game consoles, Cameras, and vehicles. Plenoptic cameras with interactive performance using GPUs and embedded cameras with GPUs like Lytro and Ximea will show up this year. We did not include Navigational units because we could not find many that used a GPU. We are specifically excluding TVs, STBs, DVD players, watches, MP3 players, and digital picture frames. No doubt as GPU IP prices drop and the quest for differentiation continues, combined with everything being on-line all the time, and the internet of things, GPUs will find their way into these other devices. But, it didn't happen in 2011. We''ve reached the point where silicon designs have become a commodity, including more quickly disposable. Mobile and desktop (and "Noteboook") are still distinct categories, but if MS$ succeeds with Windows 8 on multiple platforms, the lines will be completely blurred. I say that, because Win 8 will support ARM platforms. I do believe it stands for intellectual property. by the way, Samsung also uses Mali GPUs in their phones, and those are developed by ARM.